he World Health Organization attributes more than 4 million deaths each year to exposure to household stove smoke, especially in developing countries with high poverty rates. 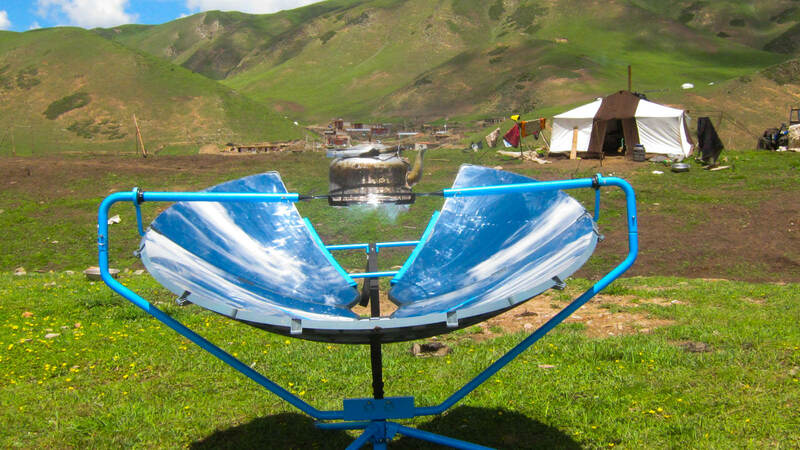 One Earth Designs developed the SolSource Solar Cooker, which offers an easy-to-use, off-grid cooking solution using only the power of the sun. CEO and Co-Founder Catlin Powers speaks about the power of coal and kerosene alternatives to reduce health risks, lessen harm done to the environment, and empower women. During a research trip to the Himalayas to study coal particle deposition on the Himalayan glaciers, I met a Tibetan nomadic family who challenged me to think more deeply about my scientific work. When I told them that I was researching outdoor air pollution, they showed me the pollution from their stove and asked me why I wasn’t studying that instead. When I measured the air in their home, I found that it was 10 times more polluted than the air in Beijing. According to the World Health Organization, 4.3 million people die every year from breathing smoke from their stoves — that’s more than AIDS and Malaria combined. After learning this, I decided to leave my research laboratory and work with the nomads to find a solution. Over the course of seven years working with local community members, we built 58 different solar-powered stove designs, finally arriving at a winning design: SolSource Solar Stove. 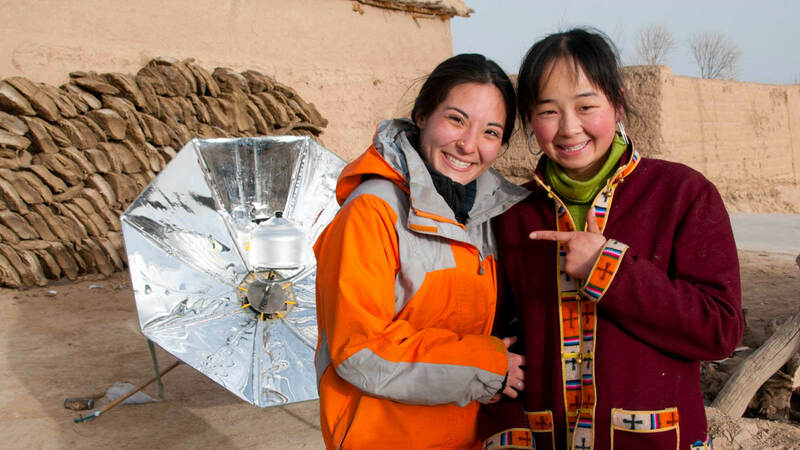 SolSource enables families to harness solar energy at 92 percent efficiency for cooking. Since many of our customers wanted to cook at night and to use the sun for their other energy needs, we’ve gone on to work on a line of solar-thermal batteries and other add-on technologies that use the solar energy harnessed by SolSource to power nighttime solar cooking, heating, cooling, electricity, and other energy needs in the home. Why does this matter so much to you? When I began living with nomads in the Himalayas, I helped them design a solar-powered stove and they showed me the love, trust, and friendship that come from relying on each other for day-to-day survival. That’s something I can never repay. So, I wake up every day and try my best to pay it forward. In developing nations, 2.8 billion people lack access to clean energy for cooking, home heating, and electricity. Every year, 4.3 million people die as a direct consequence. In developed nations, energy pollution occurs in mega-power plants far from our homes, but the consequences still affect us in the form of rising cancer rates, air pollution, and climate change. Life on Earth will sustain with or without humans. Whether Earth remains a good home for humans, however, depends on the decisions we make and the actions we take on a daily basis. At One Earth Designs, we develop products that help people live well and prosper within the resource capacity of our one Earth. By mid-century, the status-quo approach to energy is projected to lead to a global energy demand of 100 TW, far beyond the capacity of fossil fuels. Indeed, the only single energy source known to be able to meet this demand is solar energy. One hour of sunlight is enough to power all human activity for an entire year and solar energy is already distributed to every household for free. Currently, however, solar energy technologies struggle to provide affordable, reliable 24-hour energy. Further, the current solar energy paradigm focuses on turning sunlight into electricity and then back to heat, an inefficient and costly process. One Earth’s technologies have the potential to power homes more efficiently, affordably, and reliably than ever before using on-demand solarthermal power. By directly capturing and storing solar energy in molecular bonds, our system eliminates the need to turn sunlight into electricity and back to heat, thus increasing efficiency and reducing the money and surface area required to power a home with solar. One Earth Designs holds seven awarded patents related to solar energy capture, storage, and transport. 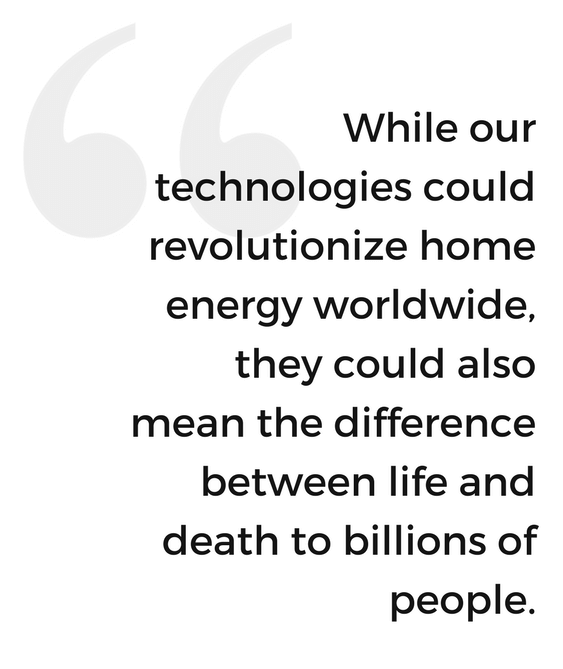 While our technologies could revolutionize home energy worldwide, they could also mean the difference between life and death to billions of people. We have already impacted thousands of lives in developing nations with our SolSource solar cookers. Our roadmap products will extend these benefits by providing 24-hour solar energy for cooking, home heating, and electricity to off-grid and low-income households. By doing so, we save lives and tap into a $100 billion global clean cooking market. 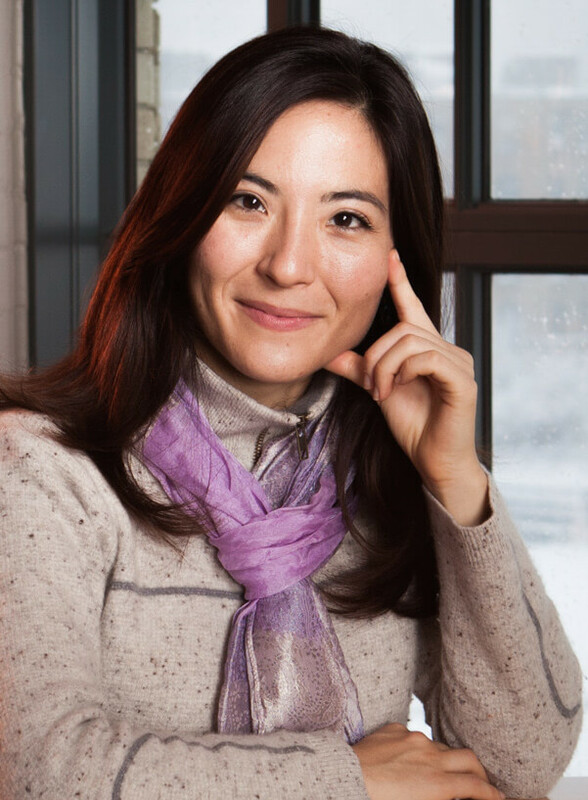 Our approach remains firmly rooted in community-centered design, while also leveraging cutting-edge technology through our partnerships with MIT and Harvard Universities. One of our customers told us that SolSource had fulfilled her dreams by enabling her daughters to attend school. The local school required each child to bring a bag of fuel to school with them and this was a big burden for many families. Before getting SolSource, most girls stayed home to collect fuel so that their brothers could attend school. Once the families and the school had SolSources, this was no longer necessary, and the girls were finally able to go to school alongside their brothers. In this moment, we felt that we had truly accomplished something good for the world and felt motivated to work even harder. We are working to move beyond the Age of Fossil Electricity into the Age of Sunlight, a future where: solar energy is harnessed by our homes and vehicles via non-toxic, efficient, and durable technologies; this energy is stored in non-toxic organic batteries; and it is used on-demand, on-site, and shared peer-to-peer as needed. Today, you can eat healthy, delicious, solar-cooked food with SolSource. Tomorrow, our technologies could be powering your house, your car, and your life.